Standing on the National Mall amidst a rainbow of union members and immigrant workers demanding Camino Americano – legalization and a path to citizenship – brought me back to the excitement and hope of the Immigrant Workers Freedom Rides ten years earlier. On October 4, 2003, more than 100,000 immigrant and native-born workers and their unions gathered at a national rally in Queens, New York after a month of Freedom Rides for immigration reform crisscrossed the country in the tradition of the civil rights movement. The first meeting I attended was in a church basement where the unions at Yale often gather. Maria Elena Durazo and Rev. James Lawson had traveled to New Haven from Los Angeles to lay out the plan and get our commitments. We started out by going around the room and saying where we or our ancestors had come from – some in gallies of slave ships, some on cargo ships, some across the desert – creating a deeper understanding that we are all immigrants with common interests. The union-initiated Immigrant Workers Freedom Ride wove together the experiences of the African American freedom struggle with the struggle of immigrants from Latin America and other continents pushed out of their land by transnational corporate greed. Arriving in the United States, these workers came to know the fear of separation from their children by deportation and being at the mercy of their employers who paid them little or nothing. 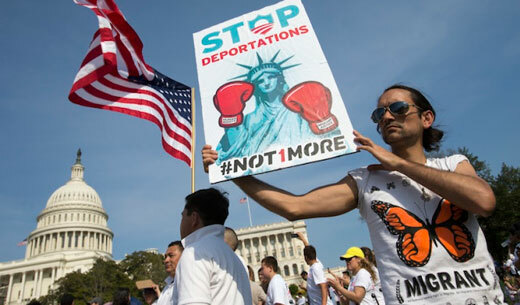 That movement has continued its push forward through the decade, from the wave of mega marches of millions in 2006 which stopped even more repressive legislation in Congress, to the immigrant youth Dreamers who have won the right to complete their higher education without deportation and are now demanding the same for their parents, to new union organizing drives. It was a great honor to have been invited to be one of the 210 who participated in civil disobedience in front of the Capitol two weeks ago to demand that Congress act now. We were black, Latino, Asian, Native American, and white. We were young and old. Tefere Gebre, an immigrant from Ethiopia and newly elected executive vice president of the AFL-CIO was among us. Maria Elena Durazo, executive vice president of Unite Here, Randi Weingarten president of the American Federation of Teachers, national leaders of the Laborers, Communication Workers, SEIU, and many more unions were a part. Eight members of Congress who reflected the racial and geographic diversity of the crowd took the first arrests. The Capitol Police, who arrested us for standing in the street after a warning that we had to leave, were themselves on furlough because of the government shutdown. They had been ordered to work but they were not getting paid. Some of the arresting officers let us know they also disagreed with family separation and senseless deportations. 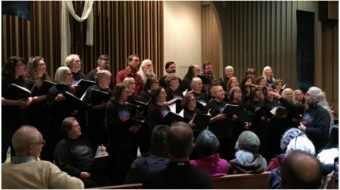 Taking a stand for justice against the exploitation of immigrant workers in the midst of the government shutdown added to the sense of solidarity and anti-racist unity. The labor movement was clearly a unifying force. Sitting in the detention room for 13 hours got me to thinking about the history of our country and the irrepressible striving for equality against the likes of the tea party extremists. The same members of Congress and their billionaire backers who held the country hostage also oppose immigration reform that benefits workers. They will continue to use their power to try and divide and conquer in the looming budget fight and to stop immigration reform. The time for government action is now. 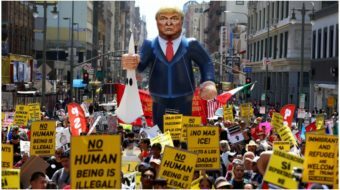 In the days and weeks to come, labor and immigrant rights organizations will hold more dramatic actions at Congressional home offices and in Washington DC. The struggle for immigrant rights and the struggle for a budget that represents the needs of the 99 percent are intertwined. Ten years since the Immigrant Workers Freedom Rides, the rights of immigrant workers and all workers are on the front burner because our country cannot advance otherwise. 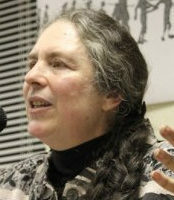 Joelle Fishman is a national vice-chair of the Communist Party USA.